Isle of Man TT renaissance man Ian Hutchinson could be poised for a sensational move to leading Ulster road race team Tyco BMW. The Bingley Bullet’s long journey back to the top following his career-threatening crash at Silverstone in 2010 was crowned by a magnificent hat-trick on the island in June, where Hutchy won both Supersport races for Keith Flint’s Team Traction Control Yamaha team and the Superstock event on Paul Bird’s Kawasaki. 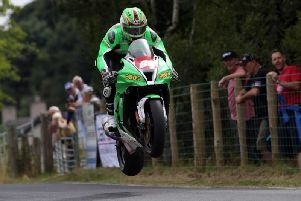 Hutchinson, who is among the entries along with PBM team-mate Stuart Easton at the Macau Grand Prix, has been strongly linked to the Moneymore-based TAS Racing outfit and would be viewed as the man who could turn around the team’s barren run at the TT, which stretches back to 2008 when Cameron Donald and Bruce Anstey were the last riders to put the Relentless TAS Suzuki machines on the top step. Given his success this year with PBM Kawasaki, it seems improbable that Hutchinson – now level with Michael Dunlop on 11 TT wins - would feel the need to look elsewhere for 2016. However, with Cumbrian team owner Bird rumoured to be changing manufacturer to lead an official Ducati squad in the MCE British Superbike Championship, it is understood Hutchinson has been forced to weigh up his options, with one source claiming a deal with Tyco BMW is all but in place. While the Ducati Panigale may be an attractive proposition for Bird on the short circuits, it would take a huge leap of faith to believe the machine could win at the TT, where reliability has proved a major problem in the past. TAS Racing team principal Philip Neill needs a proven TT winner to challenge for the top step again at the most important road racing event in the world and Hutchinson fits the bill perfectly. With William Dunlop’s departure already confirmed on Tuesday, a vacancy exists within the team for a new face alongside Guy Martin, whose own plans remain unclear for next year as he mulls his future following a crash in the Dundrod 150 Superbike race at the Ulster Grand Prix in August. Martin has stated that he intends to return to racing in 2016 and was confirmed on the entry list on the Tyco BMW for the Macau Grand Prix before the organisers revealed on Wednesday that he had been a late withdrawal. It is also understood that Dunlop won’t be the last rider to leave the team, with changes expected in the British championship line-up. British Superbike champion elect Josh Brookes appears to be in the frame to renew his ties with Neill to revitalise the team’s quest to mount a serious challenge for an elusive BSB title. Brookes was hopeful his performances on the Milwaukee Yamaha R1 this year would pave the way for a switch to World Superbikes in the new factory Yamaha team, but instead the project was entrusted to the Paul Denning-managed Crescent Racing outfit, with Alex Lowes and 2014 WSBK champion Sylvain Guintoli leading the charge with PATA confirmed as the factory squad’s title sponsors. The news came as a setback for Brookes and Shaun Muir’s Milwaukee Racing concern, who have been instrumental in the development of Yamaha’s all-new YZR-R1 and as such would have expected the chance to front Yamaha’s official return to the championship next year.